These days we can be on the phone almost anywhere. On the hoof, perhaps, but phone calls are no less important for that. 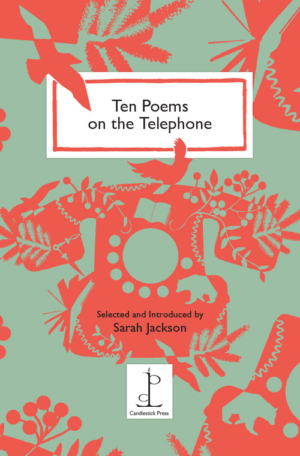 Edited by Sarah Jackson, this intriguing new anthology explores the emotional warp and weft of the telephone call – from the wrong number that brings us ear-to-ear with a stranger to the anguished message for a distant lover who hasn’t been in touch. We phone people because there is something we have to say, and these poems capture that urgency and intimacy in varied and beautiful ways. Sarah Jackson is a poet and academic who was named as one of the AHRC/Radio 3’s New Generation Thinkers in 2016. Her poetry collection Pelt (Bloodaxe, 2012) won the Seamus Heaney Prize and was longlisted for the Guardian First Book Award. Cover illustration by Katie Tooke.